Preheat oven to 250F. Arrange a baking sheet with cooling rack on the lower portion of the oven. In a small bowl, thoroughly beat eggs until completely smooth. Pour into a wide, shallow bowl (a pie plate is great for this). Add milk, orange zest, and vanilla. Slice challah into 3/4“ pieces. Soak for 2 minutes per side in the custard. Set soaked slices on a cooling sheet while you work on the remaining slices. 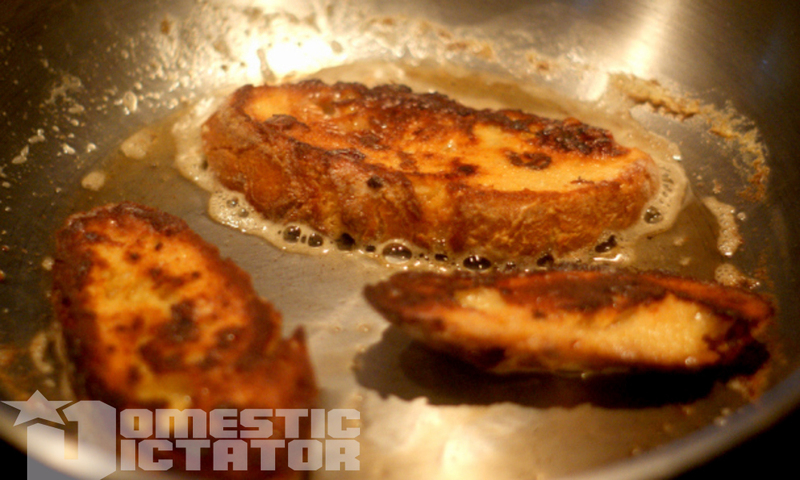 In a large skillet over medium heat, melt 1 tablespoon butter and 1 tablespoon oil. Swirl together. Arrange slices of challah, leaving room between (at least 1/2” between slices). Cook for 3-4 minutes per side, letting it get brown and crispy. Don't over-do it! Depending on your stove, you may have to adjust the heat on the second side. Move cooked challah to the oven o stay warm while you finish the rest. Add more butter and oil to the pan as needed. This recipe is so scalable. Note that this is for a WHOLE challah. If you bake a challah and have half a loaf the next morning, everything reduces by half seamlessly. Swap orange zest for cinnamon! No challah in sight? 24 Hour Bread is also a great way to make this recipe. The only substitution is the type of bread.